Malwarebytes has been facing one problem after another. Back in January 2018, a buggy update caused systems running Malwarebytes to use excessive system resources, use up memory and turn of real time web protection. Many users complained of their computer simply crashing and becoming unusable. Business owners rushed to Twitter complaining about losing profit due to the mishap. The problem has since been resolved with a recent update. 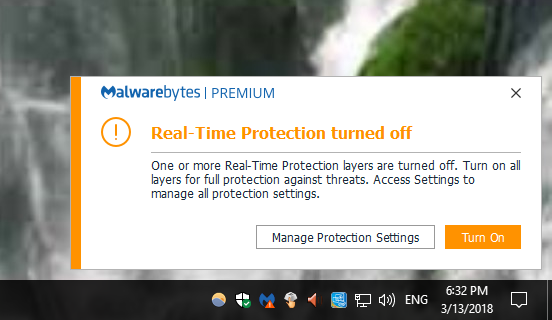 However, Malwarebytes is now facing issues with real time protection not turning on at all. Dummytech’s existing guide on turning on real time web protection seemed to have worked only for some of the users. So, I looked a bit deeper to find an easy solution and I am happy to say that a solution has been found. Right click on the Malwarebytes icon on the system tray and select Quit Malwarebytes. Visit Malwarebytes’ Product page and download the latest version of the software. Without uninstalling your existing installation, run the setup file you just downloaded. Complete the setup process. Malwarebytes will carry over your current license/subscription information to the new installation. Malwarebytes will also update the virus signature database to the latest version. Once the installation has been completed, Malwarebytes will run normally with all real time protections turned on. The root cause for this problem is thought to be corrupt virus database updates which the software fails to process. Aside from this ongoing problem, Malwarebytes is a great software for keeping your computer clean from viruses.